Designs by Lisa Somerville: Glorious Gable Box - Pre-Order yours Today! Glorious Gable Box - Pre-Order yours Today! Thanks for stopping by! 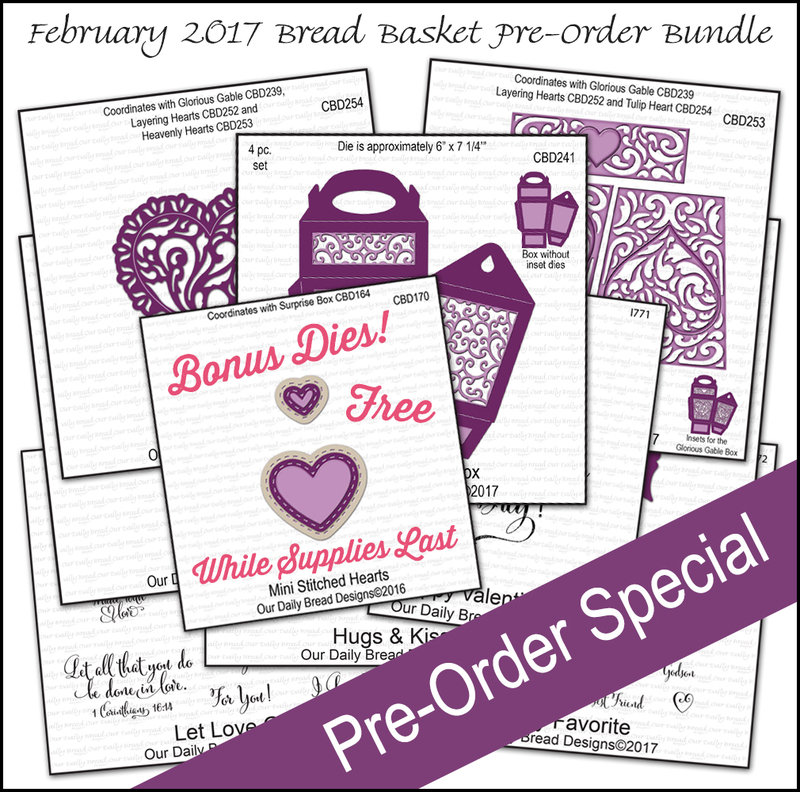 Today is a special blog post, as myself and some of the other ODBD Design Team Members are sharing projects created with the products available in the February 2017 Pre-Order Bundles! 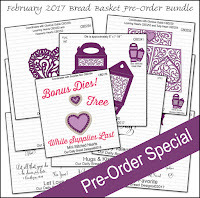 The Pre-Order Bundles can be ordered from Our Daily Bread Designs website through January 31, 2017. Please note that the individual products from the February 2017 Release will not be available for purchase until February 1st! There are THREE Pre-Order Bundles for the February 2017 Release and each money saving pre-order bundle also includes a FREE Gift! You can see all of the Pre-Order Bundles HERE on the ODBD Blog. I'm super excited to share this first project with you! ODBD carries a HUGE selection of custom dies and the Glorious Gable Box is a fabulous 3D Die that also has coordinating dies and stamp sets! The Glorious Gable Box die can be use with or without the inset dies. To create my Glorious Gable Box, I used the base panels (cut 2), the beautiful inset panels are from the Heavenly Hearts die set. I've also used additional dies and stamps from the February Release along with older ODBD Custom Dies. Please see my complete supply list below. The Glorious Gable Box would be perfect for Wedding/Shower Favor Boxes, Valentines and so much more! I filled mine with Hershey kisses! My coordinating card uses the new Layering Hearts and Heavenly Hearts die sets along with a sentiment from the Hugs & Kisses stamp set. The additional dies used are the Snowflake Sky and Bitty Blossoms and Rectangles die sets. 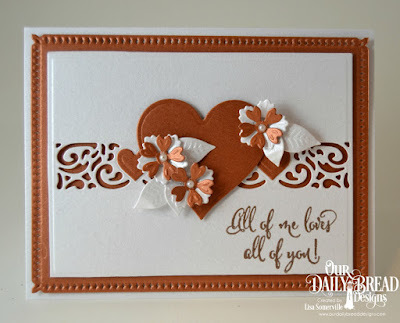 The sentiment was embossed in Copper on Shimmer card stock, then I used the inset rectangle die from the Heavenly Hearts die set to add the decorative die cut to the center of the panel (die cut twice). The die cut heart covers the area where the center meets. Loving your Glorious Gable box and card, Lisa. The choice of colors are beautiful and your layering works on them is fantastic. Beautiful set Lisa! Love the copper on white! Elegant and beautiful! Such an elegant and beautiful set, Lisa!! I just love the copper and white and all the dimension you created with the dies and flowers. Copper and white is such a cool combo!! Really different and I like it! Beautiful set with the gorgeous card! Beautiful box and love the gorgeous matching card!! 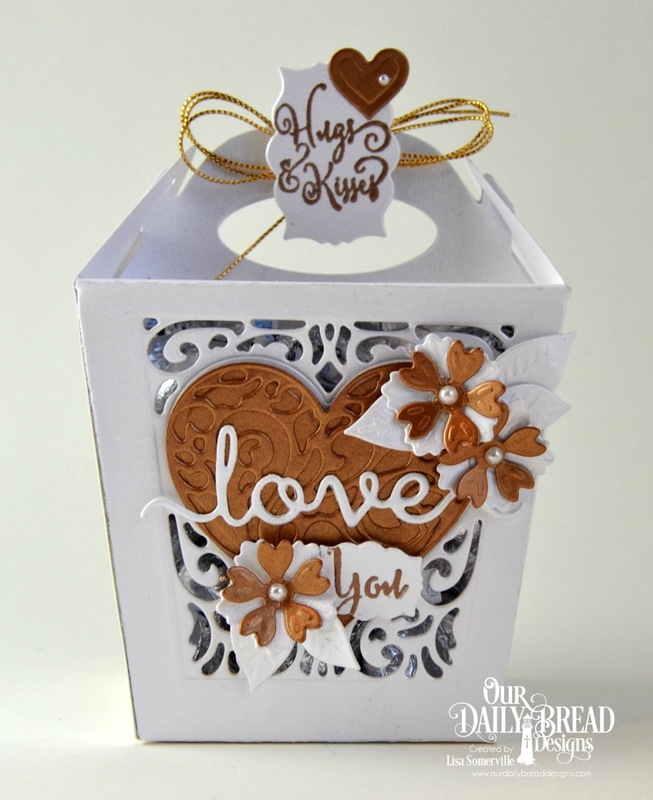 Wow, Lisa- love both the gable box and card with your lovely choice of copper and white! Great job, sweet friend- hugs! Beautiful, Lisa! Love how you used the gable box insert to decorate your card! I may need to CASE that idea!